Four years ago I travelled for the first time to Tanzania, East Africa. Amongst my many travels around the Diocese of Mpwapwa, I visited the villages of Chitemo and Nyhinila. I was welcomed by a large group of singing children, approximately 300, tots to 7 years of age. I later found out that they were orphans. Their parents had died mainly from Aids, dysentery, malaria or childbirth. 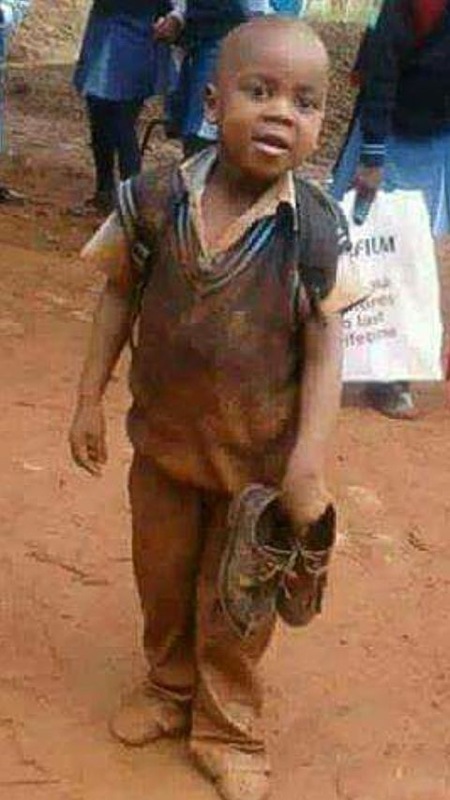 Africa can be a cruel country when it comes to orphans or those with physical or mental disabilities because there is no infrastructure to deal with them. In many areas of Africa orphans will have a tough life often left to fend for themselves from a very young age. 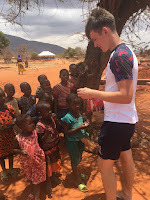 However, in these two villages the church has taken it upon itself to care for these children asking the villagers who themselves are very poor, to give them a home and four times a year at a special service donate what they can towards their care. The children have nothing to call their own, few clothes, no toys, and no school facilities apart from what volunteers are able to do for them. Their activities are always held outdoors the only shade being a tree. SEEDS4Tanzania wants to change this. When I left Chitemo that year I took a picture of the orphans under that tree and it has remained on my laptop as a screensaver and in my heart. After much thought and discussion with Chitemo and Nyhinila I felt I had to do something for them. I believe that if they are to have a future it will be through education. Education will hopefully give them the skills that will enable them to move forward in their lives and contribute to their communities, moving them out of poverty and dependency. At 7 the children attend government school which may have 100 children to a class with one teacher and no other facilities other than a blackboard. If the children have the opportunity of developing the basics in the three R�s between the ages of 3 and 7 years of age they will hopefully be in a stronger position to deal with the challenges of their next school. 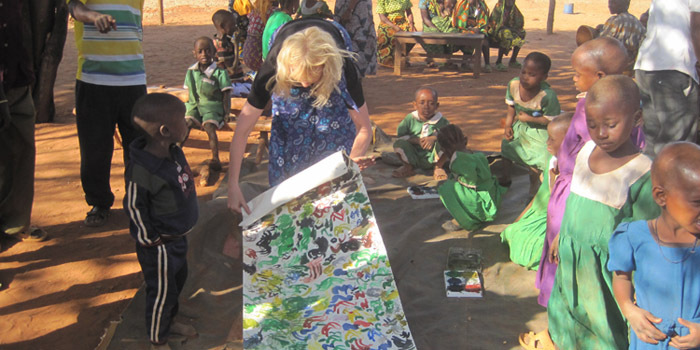 The pre-school will also be used on Saturdays by the community for various activities such as developing craft skills, mother and baby groups, scout and guide groups for older children, the opportunities are endless. During my last visit in October 2011 I was taken to 50 acres of land which lies in between the two villages and was donated by the government. This will be the ideal location to build the pre-school. The villagers have understood that they must take ownership of this project and with the church continuing to act as overseer they have organised a project committee, building committee and opened a bank account. The villagers will do all the hard work building the units classroom units and toilet facilities. 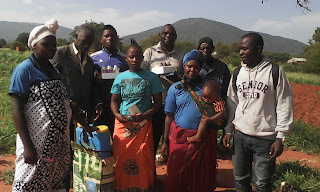 SEEDS4Tanzania will fund the training of women from the villagers as pre-school teacher and fund items such as cement, roof structures and the necessary school equipment. The teachers will be remunerated through the supplying of animals. These will provide the opportunity for the teachers to become self-sufficient and independent. This is a long term project with many challenges ahead but with your support these young children will have the future they deserve. 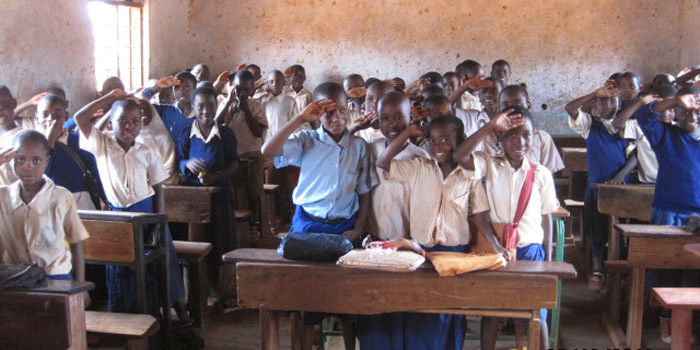 SEEDS4Tanzania believes it will happen; we need you to help it happen. We hope that by providing basic skills at pre-school level these children will be given a head start on their road to a better future. Our project will provide education and life skills to all partners involved, through project planning, teacher training, construction management and the schooling of children. Our projects are managed and supported by members of the local villages thereby giving them the responsibility to create changes to suit the needs of their own community. SEEDS fully supports the rights and needs of each child and our child protection policy is currently being developed. Development will happen in stages. Physically, as the school buildings are constructed - in the community, as the project progresses to meet their needs - socially, as all the different partners work together to fulfil the shared goal. These developments will only succeed if they are maintained. Our project is being set up providing the support and skills required to ensure a long term future. 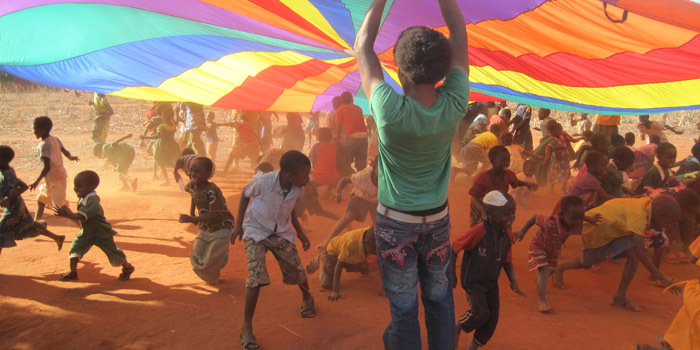 The beginning � In 2008 I travelled for the first time to Tanzania, East Africa. Amongst my many travels around the Diocese of Mpwapwa, I visited the villages of Chitemo and Nyhinila. I was welcomed by a large group of singing children, approximately 300, tots to 7 years of age. I later found out that they were orphans. Their parents had died mainly from Aids, dysentery, malaria or childbirth. Many areas of Africa can be cruel when it comes to the care of orphans and those with physical or mental disabilities because there is no infrastructure to deal with them. Orphans will have a tough life, often left to fend for themselves from a very young age. However, in these two villages the church has taken it upon itself to care for them asking the villagers who themselves are very poor, to give them a home and four times a year at a special service, donate what they can towards their care. The children have nothing to call their own, few clothes, no toys, and no school facilities apart from what volunteers are able to do for them. Their activities are always held outdoors, the only shade being a tree. 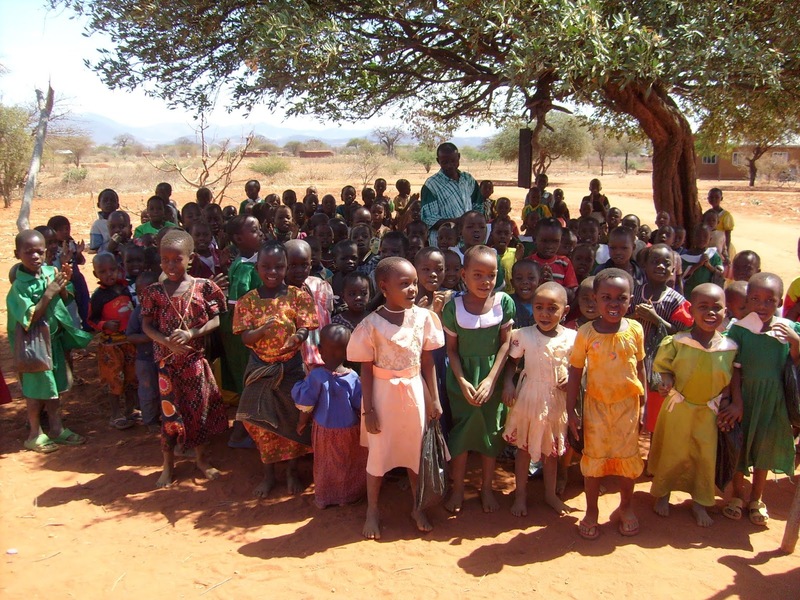 SEEDS are funding 25 Maasai orphans to enable them to attend school. We also supply funds for food to be distributed to Maasai villages where there is great poverty. The villages are in the area of Kiteto a long drive from where we have our other projects and the Maasai are very poor with few facilities if any. When we visited three years ago for the first time we were the first white people the adults and children had met. The visit was challenging for all involved, the local people, ourselves and particularly the children. However, it did not take long for all concerned to communicate and become friends. Although English had to be translated into Swahili and then into Maasai and back again. Visits since have been looked forward to by all and we shall return in October. As always the education of children is so important and without our help the children would not be able to attend school and progress in their lives. Some of the Maasai orphans who now attend school. Transporting grain and cooking oil to the villages - not an easy task. 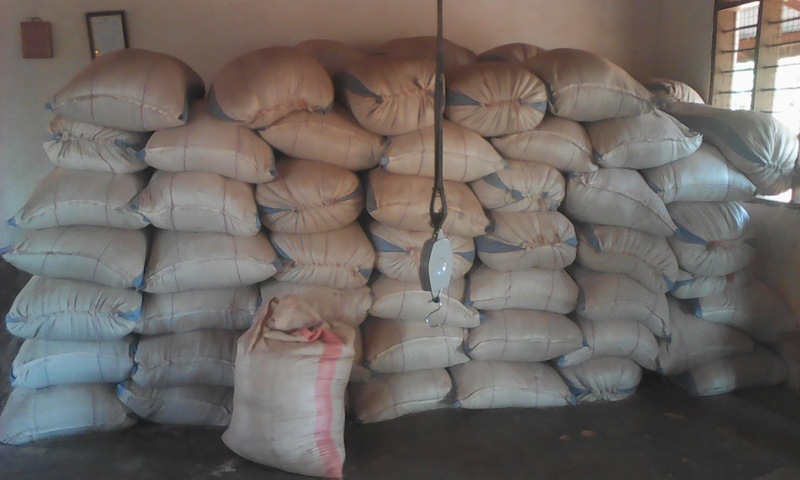 Grain and oil has been distributed to the villages by Rev Baraka. I have known Rev Baraka for 9 years we met when he was studying at the St Phillips Theological College in Mpwapwa Diocese. He is an Anglican Maasai Priest and it is through him and his heart for his people that SEEDS came to support his work. We send out funds quarterly to cover food and the children's schooling but Rev Baraka knows that this is not sustainable and will have to become self funding in the future. He now has land to cultivate crops and also a goat herd. It is hoped that these will produce the funds that are required to help with food shortage and I am hoping that we shall also find individuals who are willing to sponsor a child's schooling which amounts to £60 to cover uniform, books and stationery. My grateful thanks as always for support that is given to SEEDS for our projects. 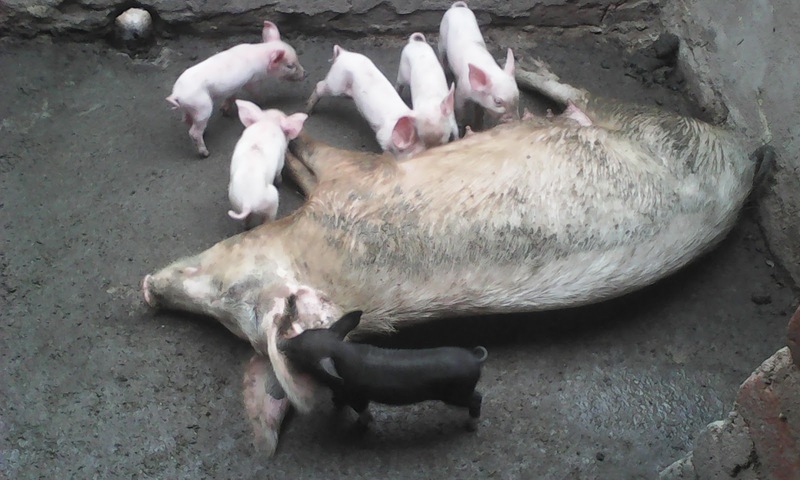 Nyhinila village has been producing piglets on a regular basis but Chitemo has not been so productive. 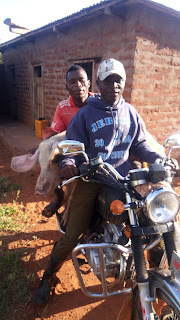 It has been a challenging time but we have overcome the problems with our experienced vet/project manager and the help of a piglet worker from Nyhinila being willing to oversee the project in both villages. We have only one boar, Trevor, who is in the Nyhinila pig unit. He has certainly been most active servicing the sows of Nyhinila and Chitemo. Chitemo is 7 kilometers from Nyhinila, so how does he do this? Well he certainly does not walk from one village to another! No he rides a motorbike (pikipiki)!!!! He is a very big boy! 'can't do' in Tanzania, the motor bike has been the answer. You may be saying why not have a boar in both villages. 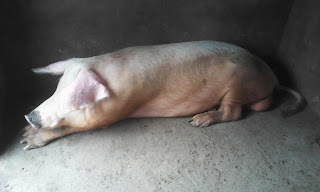 We did have one in Chitemo to start with but he did not seem very productive so he was sold and it was decided to use Trevor until problems with the piglet breeding at Chitemo were resolved. I hope we shall soon be able to give him a rest and purchase a second boar. 'Yolande' sow at Nyhinila recently gave birth to 18 piglets and 11 have survived. Yohanna's dedication and experience not only saved piglets but also Yolande who was very unwell after producing so many piglets. All is now well and the piglets will soon be available for sale. The sows in Chitemo are now pregnant and we hope to hear the good news that healthy piglets have been produced. SEEDS continues to support the project financially, pig feed for 2019, vet fees for 2019 and more, so that the funds they receive during this time from selling piglets can be saved for maintaining the schools and teachers when they take over the responsibility January 2020. The piglet breeding will then continue to give the villages the funds they require for their schools. The schools continue to progress well with the teachers engaging the children aged 3 to 7 years in reading, writing, sums and English. Once the children reach the required level in these subjects they move to government primary schools. Our children always have a head start in all subjects and are able to help the primary school children. There continues to be challenges with supplying books for the new curriculum set by the government. The supplies are always slow in coming through for non government schools. However, our teachers are helped enormously as we supply them with all the teaching materials they require to enable them to progress with the subjects they teach. In fact they have much more than would be supplied in a government school. 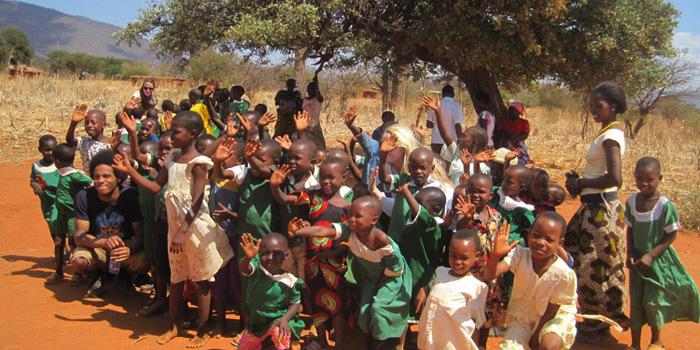 At the present time Chitemo school has 104 children registered and Nyhinila the smaller village has 82. SEEDS continues to pay the teachers allowances and supply teaching materials until the villages take over the responsibility in January 2020. The bore-hole in Nyhinila continues to work well and used by the communities in Nyhinila and Chitemo. It will become even more essential as the year moves on when other water supplies have dried up. The villagers continue to use the water filters we have provided which has reduced water related sickness particularly in the children. Thankfully the schools have continued to run as smoothly as is possible in such rural villages and are being well maintained. They remain fully equipped and supplied with teaching materials through the funding from SEEDS. The 5 teachers we trained are working well together. The children who attend school receive morning porridge to sustain them, this can be their only meal of the day. Attendance has averaged 100 pupils per school and in 2018 137 pupils reached the standard to be enrolled in the local Primary School. It is good to hear that our children are advanced in their reading, writing and sums when they attend Primary School compared to pupils of similar age. The head teacher at Nyhinila was on maternity leave for three months during 2018 which left the remaining teacher challenged to undertake all the teaching with little other help. The schools are in need of additional desks and chairs for the teachers as they only have one of each per school. A local carpenter is being sought to make these and SEEDS will look to fund them. The children are also encouraged to have some play time and we have supplied outdoor equipment of swing, slides, roundabouts and seesaws. SEEDS continues to maintain the schools and pay the teachers. This will continue until the end of 2019 when the schools will become self-funding. It was encouraging to see that the teachers are now looking into ways to generate funds for the schools. They have collected Baobab seeds (a form of vitamin C) to sell and grow sun flowers to make oil from the seeds for their own use and to sell. The funds have also provided the millet to make the children's porridge and paid for some small repairs. Desks are still in one piece! The installation of a bore-hole in Nyhinila village in 2014 has changed the lives of the people who previously had to walk 7 kilometers to Chitemo village to access water. Since its installation there have been challenges but these seem to have been addressed and water is in good supply. The money that is paid to draw water is being banked and will be used for maintenance and the purchase of fuel for the generator and pay the workers. During 2018 the bore-hole committee have built a toilet for those who work at the bore-hole and those drawing water. Also a building is now available for the bore-hole workers to cook their food and troughs have been built for animals to access. I am delighted that these additions to the bore-hole have been a committee initiative rather than contacting SEEDS for help. This is progress indeed towards the villages becoming self-sufficient and self funding. We have moved another step forward with the provision of water. To help prevent water related diseases we have supplied the villages with water filters. These are attached to water butts and after passing through the filters the water is clean and safe to drink. Over the past 2 years we have delivered 155 water filters which have been distributed amongst the people. One filter can be used by 100 people and will last up to 10 years as long as the filter is cleaned regularly, which is a very simple operation. After a very shaky start in 2017 due to the swine fever and thereafter the very slow production of piglets I am delighted to say piglet production is moving forward with leaps and bounds. We trained 5 villagers in animal husbandry specifically pig breeding and our vet Yohana oversees their progress. Two of our first sows and one boar were sold as they were not producing piglets, new sows purchased and Trevor our existing boar from Nyhinila has been working hard servicing the sows of both villages. During our October 2018 visit we were able to see a number of piglets in Nyhinila and Chitemo were waiting for piglets to be born at any time. 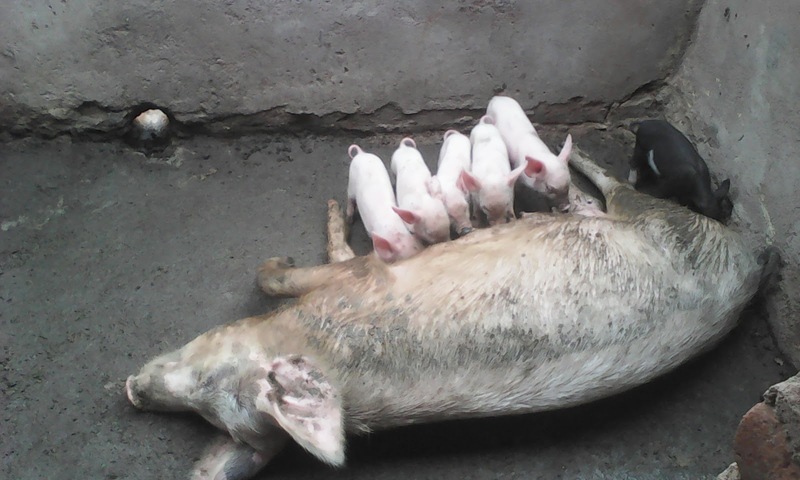 The piglets are sold once they are weaned at two months and word has already spread that the breed of pigs is of good quality so piglets are sold as soon as they are born. We have to thank the piglet workers and our vet Yohana for their commitment to the success of the project. The funds received for the piglets are being banked and these will go towards the maintenance of the schools and paying the teachers. The aim of SEEDS has always been to enable the villages to take ownership of the three projects and the piglet breeding will be the means to maintain the schools and pay the teachers. We are hoping that by the end of 2019 we shall be able to celebrate the independence of the villages. Rebecca with Ralph the runt of the litter! Malaria continues to be a serious problem throughout Africa particularly with the young, pregnant mothers and the elderly. We have supplied 600 mosquito nets that have been distributed amongst the most vulnerable children and adults in the villages. Pastor Festo the Anglican priest for the area has been an invaluable asset to overseeing the progress of our projects. Apart from all his work as a Pastor to ensure the spiritual well being of the villagers and his responsibilities as a husband, father and grandfather he has committed a great deal of time to ensure our work in the villages has progressed as smoothly as possible. He will retire in 5 - 6 years time and will not have a home of his own unless he builds one. Pastors during their ministerial life have very little funding and are mainly self supporting through the crops they are able to grow and few animals they might have. To repay him for all his commitment to our projects we are offering some funding to enable him to build a home. Every year when we visit we take out second-hand laptops/tablets and mobile phones. The laptops are such a luxury particularly for individuals who are studying. For the past 9 years we have been supporting the clinic taking out baby clothes/knitted teddies to be given as a gift to mothers who have had or having a baby. The gift of baby clothes is to encourage mothers to have their babies in the safety of the clinic, rather than at home in a village. We also provide the clinic with spectacles that have been donated, water filters, pain killers and bed sheets. The facilities of the clinic are very basic, medication is in short supply, the beds have no sheets. The Doctor, nurses and midwives work long hours and past their retirement age to be able to keep this facility available. In the area of Kiteto there are a number of Maasai villages. The villagers are extremely poor and have little more than the mud brick houses they live in and land to grow crops. 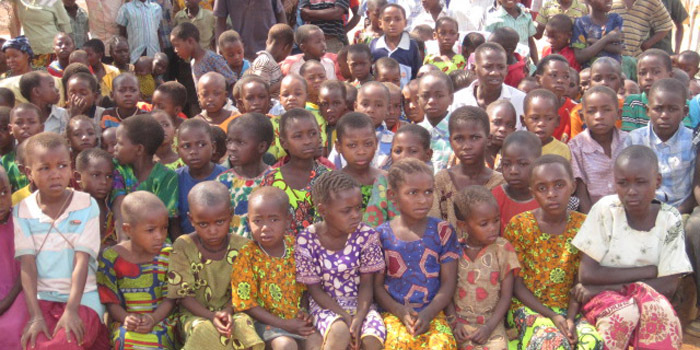 It is a struggle to send children to school, particularly if they are orphans. Also the Government schools can be many kilometers away from the villages. For the orphan children to attend school they have to be cared for by people in the villages nearest to the schools. These people have to be paid to look after and feed the children. 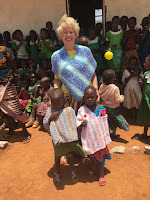 The children also require clothes and teaching materials to attend school. Fortunately to not charge schooll fees. For the past three years SEEDS have donated funds to enable 25 orphan children to be cared for and now to attend school. Also funding has been given to Rev Baraka Ngobei who has made it his ministry to help these children. The funds are used to rent accommodation for an office and store room for food. He is also growing crops and keeping goats that will help with generating funds. 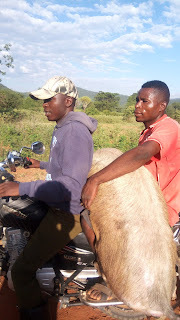 The villages are 2 to 3 hours travelling on very rough terrain from Chitemo and Nyhinila villages. The only water supply is from the river and when that is dry it mean digging down some 30 feet to access water. We have also supplied water filters. When Chitemo and Nyhinila have taken ownership of the three projects, SEEDS will no longer have any controlling or financial commitment. However, we will continue to enable orphan children from areas other than Chitemo and Nyhinila to attend school. I am hoping to find sponsorship for these children and to help those who wish to attend further education possibly moving onto University. These young people are the future of their communities and their country. All children deserve to have the opportunity of education, their future progress relies on this. It is a privilege to enable children to use their gifts to improve the quality of their future lives. A big thank you, ASANTE SANA, to all the individuals, organisations, companies and church communities that have made this possible and continue to do so. 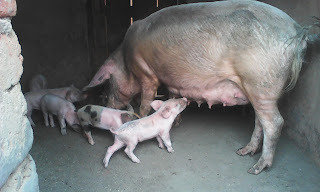 Our first piglets in Nyhinila village - Oink, Oink ! Hip,Hip, Hooray!! The breeding and selling of piglets will help our villages on the road to becoming self-supporting and independent. Yolande sow gave birth to 9 piglets sadly one died. The survivors seem to be doing well and mum Yolande is taking it all in her stride. Play time but one little piglet is having a sneaky drink! 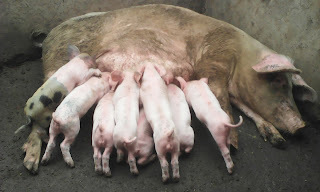 Rebecca sow gave birth to 9 piglets but sadly three have died. As far as we know all are now doing well. Five little pink piglets and one little black piglet. Looks like mum Rebecca is exhausted while the piglets are having some play time! Daddy Trevor has done his bit and its time for forty winks! We are now waiting to hear from Chitemo village as we are hoping that the two sows, Angela and Jacqui are pregnant. After more than a year delay due to swine fever our piglet project has progressed. 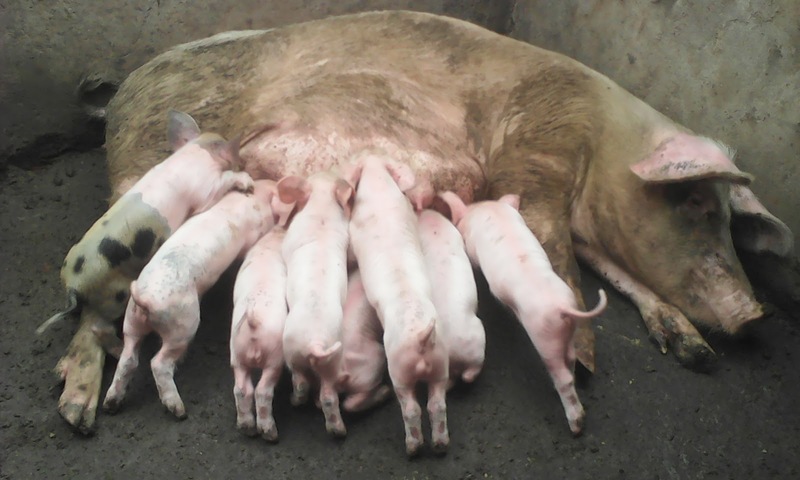 Two sows, named Yolande and Rebecca have produced 8 piglets each. Two more sows are thought to be pregnant so time will tell. We are grateful to have the expertise of our Vet Yohana who will oversea the progress of the piglets and those who are taking care of them. 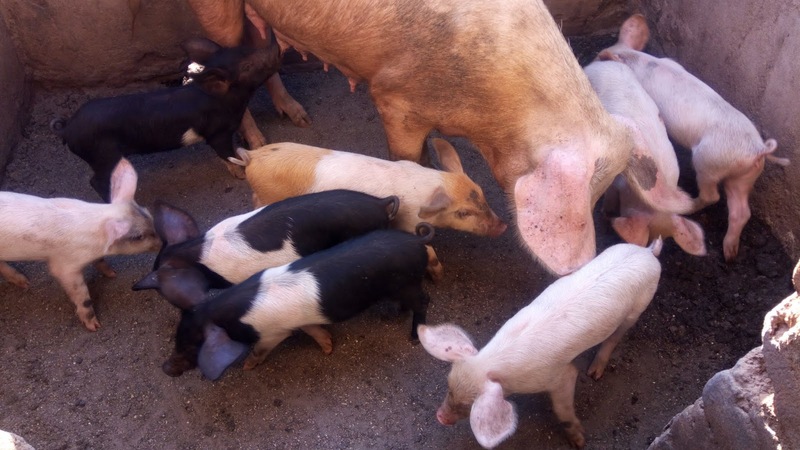 The aim of this project is that in time funds from the sale of the piglets will go towards maintaining the village pre-schools and paying the teachers thereby enabling the villages to become self-supporting and independent of aid. In the meantime SEEDS will continue to fund the schools, teachers and the piglet project. I hope in due course we shall have photographs of the piglets.